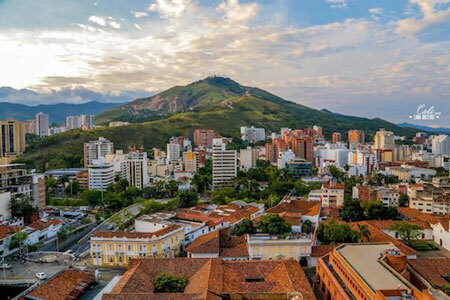 Colombia consistently ranks as a top destination for 2018. So what is so special about Colombia? Why are Americans and Europeans alike coming, and many times staying in Colombia? Besides it’s stunning physical beauty, delicious coffee, romantic pueblos, and famous magical realism authors like Gabriel Garcia Marquez, its all about the people. The culture of physicality, warmth, passion, close family ties, serving others, and joy. And let’s not forget sabor (flavor). Its not enough to read about in guide books or in walking tours to really experience this way of living. It must be experienced. And few things embody the essence of Colombia more than dancing salsa. We feel part of something dancing salsa in Colombia… Because everyone dances! Well, almost everyone. Salsa is alive here in Colombia. Its considered the salsa capital of the world, and with good reason. Colombians grow up with salsa. Its in homes. In the streets. At family parties. At cafes. In restaurants. In taxis. No exaggeration, salsa is everywhere. Its hard to find someone who isn’t impressively knowledgeable about salsa music or doesn’t know how to dance. And of course, there is no shortage of places to dance :). Not just dance clubs, but also little bars sprinkled throughout major cities like Medellin, Cali, and Bogota, as well as in every town and pueblo across the country. 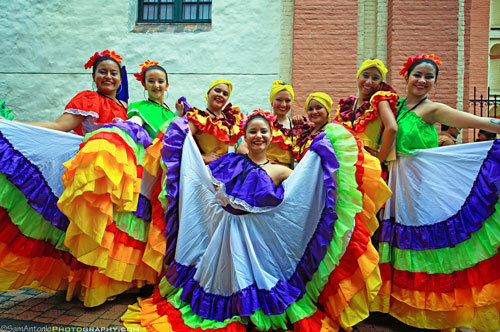 To dance salsa in Colombia is to be part of and participate in their culture. Here we can live and breathe salsa dance culture in an authentic way hard to find in North America and Europe. Learning salsa in Colombia awakens our passions and creativity. Colombians express emotions through dance. Its a cathartic therapy of sorts, using salsa dancing as a way to externalize and express their internal worlds. Love. Sadness. Anger. Everything. They are a passionate, high energy people, which is reflected in the Colombian born salsa style called salsa caleña (see video), although all styles of salsa can be danced here (on 1, on 2, cuban, and more). 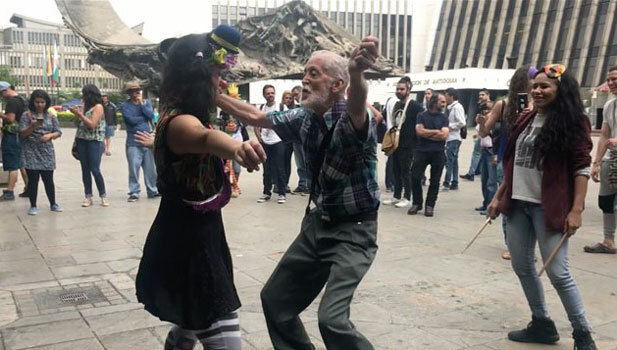 People here really know how to let themselves go and leave it all on the dance floor, all through the context of enjoyment, self-expression, and sabor (flavor). Not to mention doing it all suavecito (smooth + cool — props to Chirry). Colombians are incredibly welcoming and friendly. Colombians are brought up from a young age to be friendly, polite, and affectionate. To enjoy serving others, and practice humility. Its an incredibly welcoming culture, where you can very quickly get invited to a family dinner after just having met someone dancing — get ready for the guaro (aguardiente)! And people are definitely down to dance with you, no matter who you are or where you are. Its all about feeling good together. Learn salsa in Colombia through feeling the saboroso music. Colombians grow up listening to salsa music with their papás y familia from a young age. It’s in their blood. So when you dance salsa in Colombia, you are instantly struck how people truly feel the music. They let go of control, let go of thinking, and let their bodies interpret whatever the music, their own emotions, and their dance partners are expressing. To learn salsa in Colombia means to learn how to be present with the music, and with your dance partner… Because, if you don’t, no one will dance with you! (just kidding :P, but really, if you can do as the locals do, you can feel the depth and magic of the music + dance). 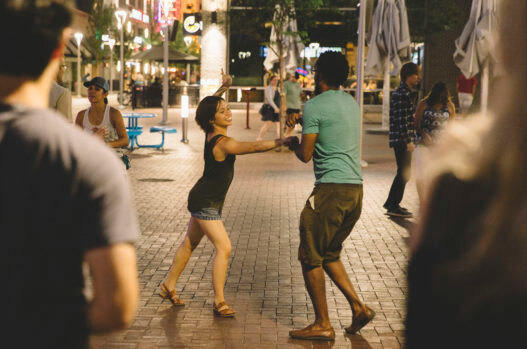 At the end of the day, dancing salsa is all about happiness down here. Its an essential feature of the music. It’s a way to experience our lives with a smile, no matter what the circumstance. Had your heart broken? No problem, we can dance some salsa. Lost all of your money? No problem, we can move and feel good with our friends and family. No matter what the circumstance, dancing salsa in Colombia teaches foreigners and locals alike how to experience joy through an embodied practice. It holds similar health benefits as yoga and meditation, only dare we say…a lot more fun! So why are travelers going to learn salsa in Colombia? To put it simply: to learn how to feel good. Together.